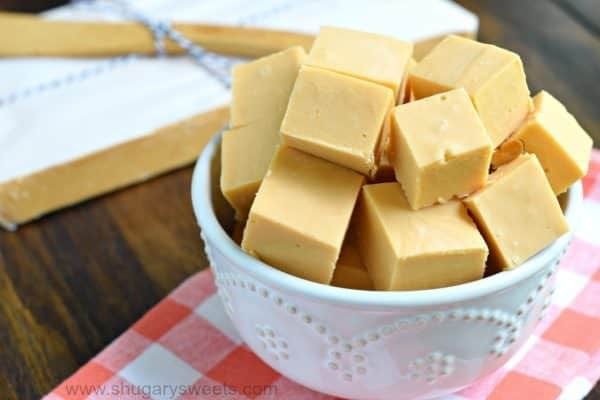 Creamy, melt in your mouth Butterscotch Fudge is an easy recipe to make any time of year! 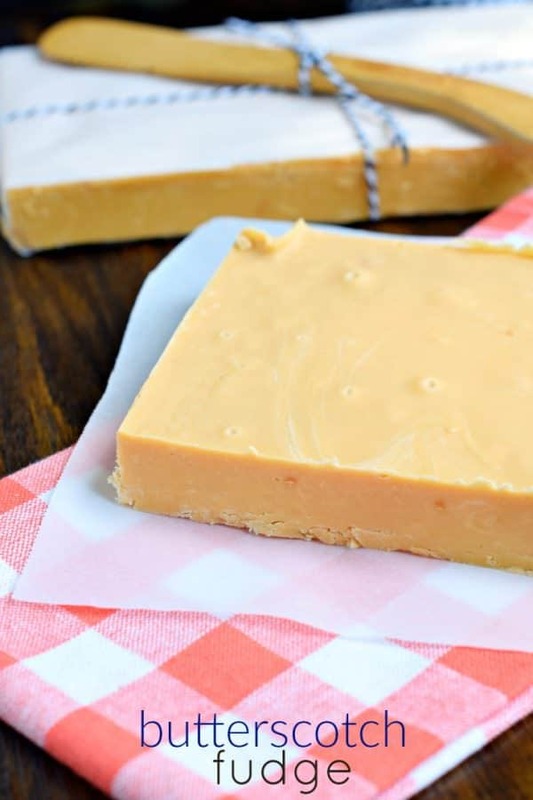 This fudge requires NO candy thermometer! Sometimes it’s the most simple of flavors that tempt our taste buds. For me, that flavor is BUTTERSCOTCH. I don’t bake nearly often enough with this flavor. If I did, I probably would weigh twice as what I do now because I have zero self control when it comes to butterscotch flavored desserts. As I was wracking my brain about what my next fudge recipe should be…BUTTERSCOTCH FUDGE just kept jumping out at me. I wanted to come up with something fun, and festive, and maybe add nuts, or chocolate, or sprinkles…but you know what? This simple (possibly boring looking) fudge is perfect. Seriously. It doesn’t need anything drizzled over the top. No chunky nuts to chew on. And it definitely doesn’t need sprinkles. The rich flavor of butterscotch is absolutely perfect. I may or may not have had a slight problem with over eating when it came to this treat…which is why I enlisted my friends on facebook to help out! One simple shout out “FREE FUDGE TO GOOD HOME” was all I needed to do to share the love of this delicious dessert with my friends. Within the hour I was able to rid my home of this treat…but between you and I, (well, and I guess the internet) I kept a little bowl in the back of my fridge for later. Knowing How to Make Fudge is a simple trick that will make you the hit of every party! Making fudge is easier than you think and it is so easy to personalize with your favorite ingredients and flavor combinations. Have all your ingredients on hand before starting. Line an 8inch square baking dish with parchment paper. Add your butterscotch morsels and marshmallow cream to a mixing bowl before starting (no need to stir, just dump them in there). When you boil your sugar, cream and butter mixture bring it to a ROLLING BOIL. No need for a candy thermometer, just set a timer for 4 minutes. Stirring constantly, continue to boil. After 4 minutes, pour this hot mixture over your butterscotch and marshmallow. Using an electric mixer, blend until smooth (and butterscotch is melted). Mine takes about 1 minute. Immediately pour into prepared baking dish. REFRIGERATE for 3-4 hours until firm. Slice and enjoy. This can be stored in an airtight container at room temperature, however, I LOVE the butterscotch flavor chilled! Who will YOU make this fudge for today? Check out some of my other favorite truffle and candy recipes! 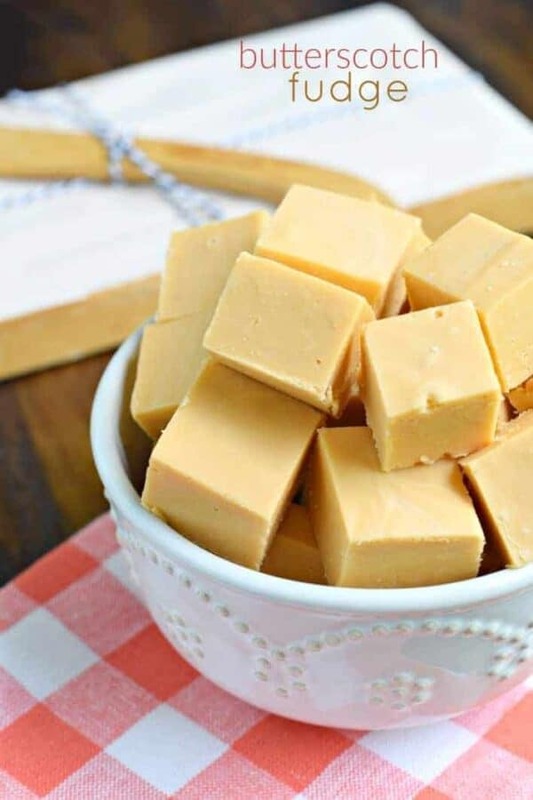 Be sure to stop over at Food Fanatic to print out this delicious Butterscotch Fudge recipe! I was just making something with butterscotch yesterday and couldn’t stop eating it! So I feel ya, girl. Can’t wait to try this fudge. It might look simple, but I know those flavors are exploding! I don’t bake with butterscotch much, either. I always seem to forget about it, but it’s a favorite of mine. This fudge looks SO good! 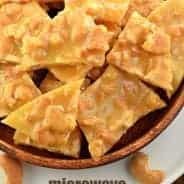 I just love butterscotch, I remember growing up my mother always msde butterscotch pie, delish. cannot wait to make this fudge. Need to stop at the grocery store tomorrow for ingredients. I will have to share with friends or I will eat it all. Enjoy Sheila! Let me know how it turns out! That sounds really good! Thanks for sharing. I like how there is no candy thermometer involved!! It’s interesting that ingredients that you take for granted are not available to all bakers, even in areas you think would carry them. Always enjoy reading comments on sights like this. 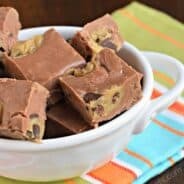 This fudge looks awesome and wonder what it would be like with chocolate or peanut butter chips? Wow fudge looks incredibly delicious! Is marshmallow cream that stuff in the jar called fluff? 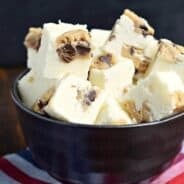 I am also looking for an easy maple walnut fudge recipe. Would love to know what you have on that. We do not get marshmallow cream here in Greece… can I substitute it with something else? I really want to make the recipe. I think I can find marshmallows… do they get melted to produce the cream? Or is the cream a whole different thing with many ingredients inside? Thanks! Yes, it would work to melt the marshmallows, that’s what usually do anyway-cheaper! I made this yesterday , It was so easy to make and ……. soo good!!!!! One question … is it possible to cut down the amount of suffer or would this mess with the recipe?